The perfect addition to your outdoor decor, our handcrafted Amish Classic Terrace Coffee Table is both stylish and versatile. Made from recycled plastic, this eco-friendly poly table is built to withstand decades in your outdoor furniture oasis and maintain beauty and integrity! 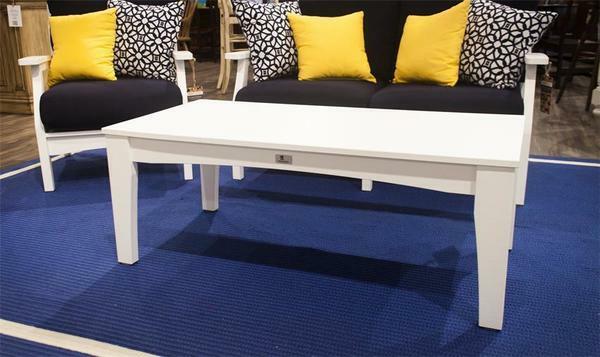 Available in an array of colors to fit in with any decor, you're sure to find just the right coffee table to seamlessly join your outdoor collection. Pair with our Terrace Sofa and End Table for a perfect seating area that will leave a lasting impression on your family and friends! The entire set, as pictured, can be found here. Call one of our experienced Amish Furniture Specialists today with any questions or to start your order - toll-free at (866) 272-6773. Total Width - 23 5/8"
Total Height - 18 1/4"
Not available in Regular Two-Tone, Tropical, Tropical on White, Natural Finishes Two-Tone.